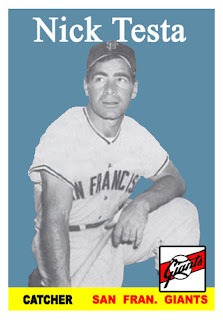 Nick Testa made the most out of his one major league appearance with the 1958 San Francisco Giants, spending seven decades in the game as a player and a coach. A professional career that started in 1946 took him across the globe to far-reaching baseball venues such as Colombia, Italy, and Japan. The well-traveled baseball lifer passed away November 16, 2018, in Hastings-On-Hudson, New York. He was 90. Testa’s lone major league game came on April 23, 1958, when he pinch-ran for Ray Jablonski in the 8th inning. 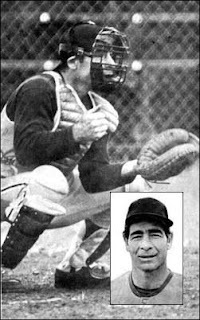 He remained in the game as the catcher, where he was charged with an error in the 9th inning when the San Francisco winds blew a pop-up out of his reach. That error made his only mark in the record books, as he was two batters away when Daryl Spencer launched a two-run home run to cap the Giants’ comeback victory. Shortly after his cameo, Giants manager Bill Rigney made Testa an interesting offer. With Bob Schmidt and Valmy Thomas holding down the catching duties, it was clear that Rigney did not need a third-string receiver. Testa finished the season as their bullpen coach and in 1959, he returned to the minors, where he played through 1964. 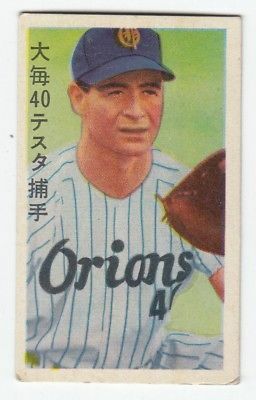 During this period Testa became part of the early group of Americans to play in Japan when he spent the entire 1962 season with the Daimai Orions. While Testa was no longer playing affiliated ball, it was far from the end of his time on the field. He returned home to the Bronx to work as a health and physical education instructor at Lehman College, where he piloted their baseball program to the 1974 CUNY Baseball Championship. During his summers off from teaching, Testa played in the Canadian Provincial League well into his 60s, often facing high-level competition half his age. The professor was a fixture for both of New York’s professional teams, serving as a batting practice pitcher for the Mets and the Yankees. Testa continued with the Yankees through their championship run in the late 1990s and early 2000s. In 2001, the Yankees tasked the 73-year-old Testa with the responsibility of preparing then-President George W. Bush for his historic first pitch at the 2001 World Series. Before Game Three, Testa patiently caught the President's warm-ups in the Yankee Stadium tunnels before he made his way to the mound. Testa remained a pillar of physical fitness well into his 80s, serving as an exemplar for the multitudes of students he prepared for work in the field. Lehman College inducted him into their Athletics Hall of Fame in 2001. In 1964 Nick was behind the plate for the Yakima Braves of the Northwest league...I came to bat and Nick says to me "I'm starting my 20th year in Professional Baseball"...I was starting my 2nd year. I doubt we will see a 20-year vet in A-ball ever again unless it's a rehab stint.